The Upcoming events in the sidebar here will update to reflect that whenever WordPress’s cache expires. And that bug is finally about to get fixed. Dylan is out sick today, and we don’t have any major updates to share at the moment anyway, so we’re cancelling today’s meeting. We’ll see you on June 6th. New Features: Comments are remembered if you cancel an edit or navigate away from the bug page, and private comments are more obviously private. Two weeks worth of changes. Seven contributors. 89 files changed, 747 insertions(+), 1249 deletions(-). What have I been hacking on this Saturday? There was a lot of good information in today’s project meeting. Below are the minutes from the meeting as well as a link to the video recording of the meeting. Be sure to check out and comment on the new project roadmaps! http://www.bugzilla.org was switched over to GitHub Pages finally – this gets it out of Mozilla’s internal hosting infrastructure and into somewhere the Bugzilla project has some amount of control over. This push includes 21 updates from 6 contributors; two of those are first-time contributors. I think my new name might be Dylan “Twenty Unreviewed Pull Requests” Hardison. In my last blog post, I dove into some of the code behind the sudo command. I thought this was pretty fun. sudo is one of those commands that I use quite often but haven’t had the chance to look into truly. I started thinking about other commands that I use on a daily basis but had little understanding of the internals of. The first command that came to mind is cd. cd stands for change directory. Simply put, it allows you to set your current working directory to a different directory. So, the first thing I did was figure out what exactly was invoked when I ran cd on the command line. I used the which command which displays the path of the binary associated with a particular command. Oh, bother! Reading shell scripts can be such a hassle sometimes. I know the tr command is used to translate characters. In this particular case, the second half of the command, the part after the pipe symbol, basically converts the command cd dev to CD dev. I have no idea why this is. In any case, this modified command is passed to the builtin command which is handled by the shell (Bourne shell) that we are using. I decided to dive into the code for the Bourne shell to see what I might be able to figure out about these builtins. I came across the definition of the cd builtin here. I’ll admit that it was a hassle to read this file. For one, the source for Bash does not have a mirror on GitHub, so I had to browse through a hosted version with a somewhat cumbersome file browser. Nonetheless, I read through some of the code that was defined in this file. Some of it was in functions, and other bits were in templates, but after a while, I figured that most of the code was a wrapper around a function called chdir. A lot of the functions defined in the cd.def file linked above actually just invoke chdir and handle errors and parameter cleaning. I did some Googling on what the chdir function is. It’s a function that is a standard part of Unix. So to figure out more about how chdir worked, I had to dive into the code for the Linux kernel which can be found here. I started, as I usually do, by searching for the term “chdir” using the GitHub search bar. 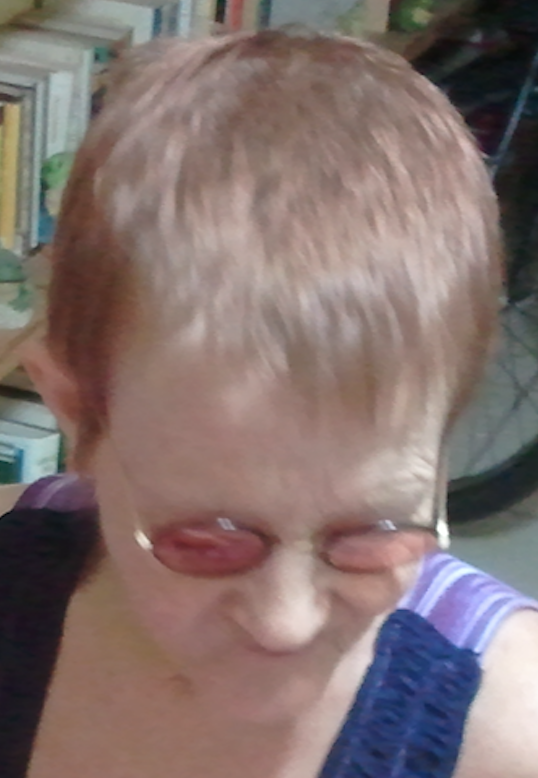 I find that it is accessible and useful. After scrolling through some of the results, I realized that OMG something I learned at university was going to come handy to me. The chdir function implements a system call. What’s a system call? A system call is a process by which a user program (like Bash) requests access from the kernel to execute a command. Usually, this is done for commands that require a certain amount of privilege. Changing into a directory is a privileged command from the operating system perspective. You’re essentially giving the user access to a new portion of the file system on the machine so it makes sense that programs would have to pass that request to the kernel for security reasons. So all in all, here is what happens when you run cd on the command line. The cd builtin is invoked as part of the Bash shell. The Bash shell invokes the chdir function. The chdir function is part of Unix and invokes the chdir system call. The Unix kernel executes the chdir call and does its own low-level thing. I could dive in a little bit more into how #4 works, but let’s be honest, I’ve already read too much code at this point, and my eyes are starting to hurt. I hope reading this was illuminating for you! UPDATE: After reading this blog post, Julia Evans (@bork), provided the following insights on why cd is implemented the way it is through an email. So!! Why is cd a builtin function in bash and not a program? Some builtins (like time) are bash builtins but they would also work as standalone programs. Is cd one of those? Every process has a set of attributes that the Linux kernel stores. These attributes are things like environment variables, signal handlers, and – the process’s current working directory!!! Processes aren’t allowed to change each other’s attributes (if I’m a program, I can’t change the working directory or environment variables of another process). So bash has to call the chdir syscall itself which is why it’s a builtin. changes, on a friday? Almost never, but content changes? lgtm. release tag the following changes have been pushed to bugzilla.mozilla.org:  Update bug form.mdn for developer.mozilla.org product name  Allow ‘self’ frames in bug modal again (fix socorro lens) discuss these changes on mozilla.tools.bmo. release tag the following changes have been pushed to bugzilla.mozilla.org:  Update bug form.mdn for developer.mozilla.org product name  Enable reporting-only CSP by default discuss these changes on mozilla.tools.bmo. Today we have several new releases. Bugzilla 5.1.2 is an unstable development release. This release has not received QA testing from the Bugzilla Project, and should not be used in production environments. 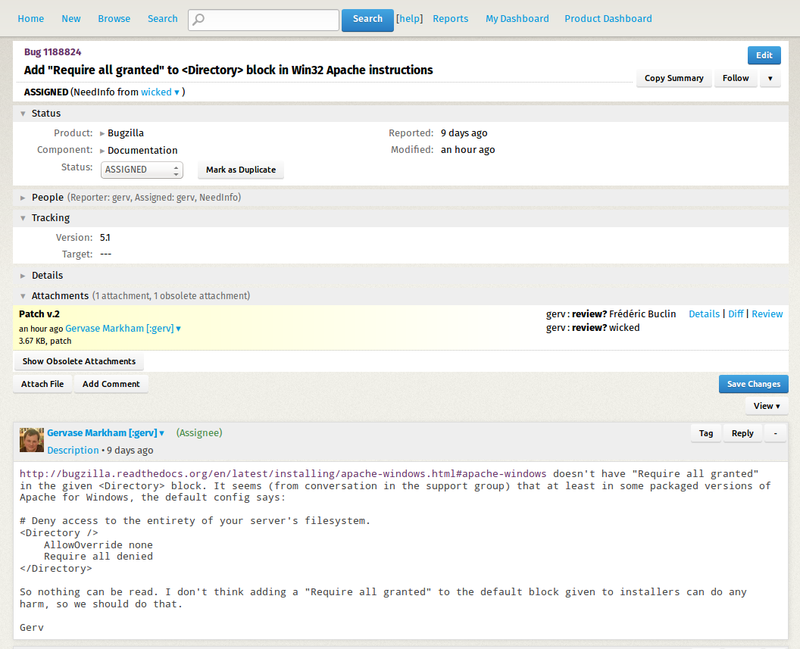 Development releases exist as previews of the features that the next major release of Bugzilla will contain. They also exist for testing purposes, to collect bug reports and feedback, so if you find a bug in this development release (or you don’t like how some feature works) please tell us. Stuff that landed in 2016 Here’s a sampling of improvements to BMO that were launched in 2016. 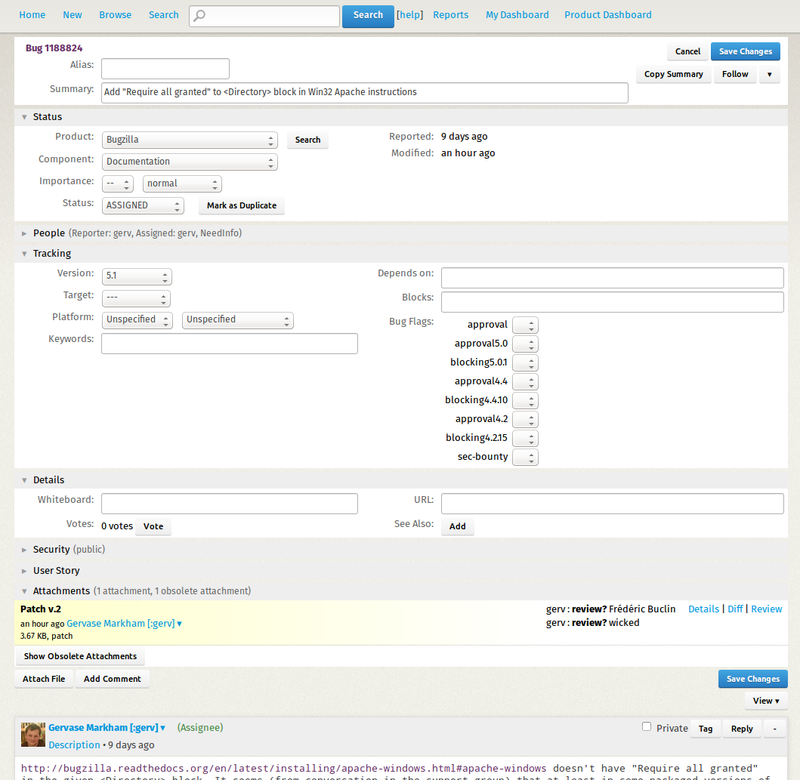 Improvements to bug-modal We’ve continued to refine the modal bug view, aka the “experimental UI”. The BMO team fixed 39 bugs relating to the new interface in 2016. We’ve got a couple more blockers before we make the modal view the default, which should happen in the middle of January. We know there are a still a few outstanding bugs and some missing functionality, so we will leave the standard view available for a little while, at least until all the blockers of bug 1273046 are resolved. One recurring subject on the bugzilla support mailing list is the installation of the Perl modules that Bugzilla requires to function. When you are installing on a Linux distribution, the recommended course of action is to use the packages supplied by the distribution. But, on some distributions, these can be of a version lower than what is required by Bugzilla. One such distribution is RHEL. Version 7 came out in 2014 and its long support life cycle make it popular for people to use it as a base for their bugzilla instance. Using Bugzilla 4.4 is easy because all Bugzilla's mandatory Perl packages are available by default but Bugzilla 5.0 came out after RHEL7 was released and a number of Perl modules aren't available or are outdated. Users then try to install the missing modules themselves, which is something easy to get wrong. I decided to see if this could be made simpler. My first step was to see if the modules could be supplied in EPEL, a third-party software repository for RHEL and CentOS but some of the modules concerned are in RHEL which makes them impossible to update via EPEL. Another solution is the use of Fedora's COPR, an easy way for Fedora developers to maintain third party repositories for Fedora and/or RHEL. The bugzilla package will be updated everytime a new version of Bugzilla is released and its support will end when the Bugzilla developers end support for the 5.0 branch. Security Advisory that was published along with these releases. Bugzilla 5.1.1 is an unstable development release. Note:Make sure ImageMagick is up-to-date if the BmpConvert extension is enabled. extension for now (bug 1269793). For historical reasons (or “hysterical raisins” as gps says) that elude me, the BMO database has been in (ughhh) Pacific Time since it was first created. This caused some weirdness on every daylight savings time switch (particularly in the fall when 2:00-3:00 am technically occurs twice), but not enough to justify the work in fixing it (it’s been this way for close to two decades, so that means lots of implicit assumptions in the code). It’s been a whole year since my last BMO update, partly because I’ve been busy with MozReview (and blogging a lot about it), and partly because the BMO team got distracted from our goals by a few sudden priority changes, which I’ll get to later in this post. Plans from 2014 Even with some large interruptions, we fully achieved three of our five goals for the year and made good progress on a fourth. Bugzilla 5.0rc3 is our third Release Candidate for Bugzilla 5.0. This release has received QA testing, and should be considerably more stable than the development releases before it. It is still not considered fully stable, and so you should understand that if you use it, you use it at your own risk. Everyone loves statistics! Right? Right? Hello? tap tap feedback screech Well anyway, here are some numbers from BMO in 2014: BMO Usage: 33 243 new users registered 45 628 users logged in 23 063 users performed an action 160 586 new bugs filed 138 127 bugs resolved 100 194 patches attached BMO Development: 1 325 bugs filed 1 214 bugs resolved Conclusion: there are a lot of dedicated Mozillians out there! BMO currently supports five—count ‘em, five—ways to search for bugs. Whenever you have five different ways to perform a similar function, you can be pretty sure the core problem is not well understood. Search has been rated, for good reason, one of the least compelling features of Bugzilla, so the BMO team want to dig in there and make some serious improvements. At our Portland get-together a couple weeks ago, we talked about putting together a vision for BMO. In 2010, johnath did a very popular video introducing people to Bugzilla, called “Bugzilla for Humans“. While age has been kind to johnath, it has been less kind to his video, which now contains several screenshots and bits of dialogue which are out of date. And, being a video featuring a single presenter, it is somewhat difficult to “patch” it. Enter Popcorn Maker, the Mozilla Foundation’s multimedia presentation creation tool. I have written a script for a replacement presentation, voiced it up, and used Popcorn Maker to put it together. It’s branded as being in the “Understanding Mozilla” series, as a sequel to “Understanding Mozilla: Communications” which I made last year. Because it’s a Popcorn presentation, it can be remixed. So if the instructions ever change, or Bugzilla looks different, new screenshots can be patched in or erroneous sections removed. It’s not trivial to seamlessly patch my voiceover unless you get me to do it, but it’s still much more possible than patching a video. (In fact, the current version contains a voice patch.) It can also be localized – the script is available, and someone could translate it into another language, voice it up, and then remix the presentation and adjust the transitions accordingly. Props go to the Popcorn team for making such a great tool, and the Developer Tools team for Responsive Design View and the Screenshot button, which makes it trivial to reel off a series of screenshots of a website in a particular custom size/shape format without any need for editing. The load time for viewing bugs on bugzilla.mozilla.org has got 2x faster since January. See this tweet for graphical evidence. If you are looking for a direction in which to send your bouquets, glob is your man. We did a Bugzilla security release today, to fix some holes responsibly disclosed to us by Check Point Vulnerability Research, to whom we are very grateful. The most serious of them would allow someone to create and control an account for an arbitrary email address they don’t own. If your Bugzilla gives group permissions based on someone’s email domain, as some do, this could be a privilege escalation. This code creates a new Bugzilla user in the database when someone signs up. $cgi is an object representing the HTTP request made to the page. The issue is a combination of two things. Firstly, the $cgi->param() call is context-sensitive – it can return a scalar or an array, depending on the context in which you call it – i.e. the type of the variable you assign the return value to. The ability for functions to do this is a Perl “do what I mean” feature. Therefore, when assigning the result of a function call as a hash value, if the return value is a single scalar, all goes as you would expect, but if it’s an array, the second and subsequent values end up being added as key/value pairs in the hash as well. This allows an attacker to override values already in the hash (specified earlier), which may have already been validated, with values controlled by them. In our case, real_name can be any string, so doesn’t need validation, but login_name most definitely does, and it already has been by the time this code is called. would end up overriding the already-validated login_name variable, giving the attacker control of the value used in the call to Bugzilla::User->create(). Oops. I’d say it might be wise to not ever allow hash values to be assigned directly from functions without a call to scalar. UPDATE: We have reset all passwords on all Landfill test Bugzilla systems. All users will be required to set a new password the next time they access the test Bugzilla systems. One of our developers discovered that, starting on about May 4th, 2014, for a period of around 3 months, during the migration of our testing server for test builds of the Bugzilla software, database dump files containing email addresses and encrypted passwords of roughly 97,000 users of the test build were posted on a publicly accessible server. As soon as we became aware, the database dump files were removed from the server immediately, and we’ve modified the testing process to not require database dumps. Generally, developers who use our test builds have told us they understand that these builds are insecure and may break, so they do not use passwords they would reuse elsewhere. However, because it is possible that some users could have reused their passwords on other websites or authentication systems, we’ve sent notices to the users who were affected by this disclosure and recommended that they change any similar passwords they may be using. It’s important to note that, unless users reused the password they used on landfill.bugzilla.org, this does not affect bugzilla.mozilla.org email addresses or passwords. We are deeply sorry for any inconvenience or concern this incident may cause you. All of today’s releases contain a security fix. We recommend that all Bugzilla administrators read the Security Advisory that was published along with these releases. Bugzilla 4.4.5 is our latest stable release and contains a security fix. Bugzilla 4.5.5 is an unstable development release. This release has not received QA testing from the Bugzilla Project, and should not be used in production environments. Development releases exist as previews of the features that the next major release of Bugzilla will contain. They also exist for testing purposes, to collect bug reports and feedback, so if you find a bug in this development release (or you don’t like how some feature works) please tell us. Thanks to glob, we’ve got some interesting stats from BMO as it crosses the 1M bug mark. We think the earliest bug filed by someone who is still involved with Mozilla is bug 283, which was filed by Wan-Teh Chang on 1998-04-29. 2263 people who logged into Bugzilla at some point in April (i.e. are active users) have filed more than 10 bugs. There are four new releases today. All of today’s releases contain an important bug fix discovered since the last release. Bugzilla 4.5.4 is an unstable development release. This release has not received QA testing from the Bugzilla Project, and should not be used in production environments. Development releases exist as previews of the features that the next major release of Bugzilla will contain. They also exist for testing purposes, to collect bug reports and feedback, so if you find a bug in this development release (or you don’t like how some feature works) please tell us. A large number of external applications have grown up around Bugzilla serving a variety of purposes. One thing many of these apps have in common is a need to get updates from Bugzilla. Unfortunately, the only way to get notifications of changes was, until recently, to poll Bugzilla. Everyone knows that polling is bad, particularly because it doesn’t scale well, but until recently there was no alternative. Thus I would like to introduce to the world Bugzfeed, a WebSocket app that allows you to subscribe to one or more bugs and get pushed notifications when they change. Or, how to migrate to git using only three programming languages Another aspect of Bugzilla has been dragged, kicking & screaming, into the future! On March 11, 2014, the Bugzilla source moved to git.mozilla.org. We’re still mirroring to bzr.mozilla.org (more on that later), but the repository of record is now git, meaning it is the only place we accept new code. Getting over there was no small feat, so I want to record the adventure in the hopes that it can benefit someone else, and so I can look back some day and wonder why I put myself through these things. Some of you may have noticed that, after a long history of contests, there was no competition to predict the time of arrival of the 900,000th bug on bugzilla.mozilla.org. This was because we were preparing for the big 1M. Now we are over 9000,00 (can that really be right? 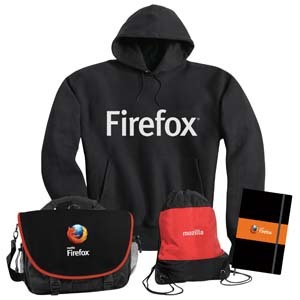 ), I can reveal that the prize for the Millionth Bug Sweepstake will be the top-of-the-range Most Splendid Package from the Mozilla Gear Store, which includes a black hoodie, a drawstring tote bag, a Moleskine notebook, and a Rickshaw laptop bag, all Firefox or Mozilla-branded. The aim of the contest is simple – you need your guess to be the closest to the actual filing date of the one millionth bug in our Bugzilla installation. All times are in ZST (‘Zilla Standard Time, a.k.a. Pacific Time, as displayed in Bugzilla timestamps unless you’ve changed a pref). If you prefer to be contacted on a different address, add that as well, in brackets on the end of the same line. We have ample graphs and charts (requires editbugs) to help you with your assessment. But if you can’t be bothered to do any research and analysis, just guess optimistically and hope! This is a Mozilla community event. To keep it that way, entrants must have either a Bugzilla account on bugzilla.mozilla.org created before the end of July 2013, and which has done something useful in the past six months, or a Mozillians account vouched for before the same date. Anyone who meets those criteria can (and is encouraged to) enter, including Mozilla employees. Once the bug is filed, I’ll check those entries who are closest, and keep discarding them until I find one which meets these criteria. Therefore, there’s no point posting this to Slashdot or any other non-Mozilla-focussed news source. But please do post it in Mozilla news sources! Badly-formatted entries may be discarded. The judge’s decision is final, and any funny business regarding the filing of bugs on or around the one million mark will be frowned upon. The closing date for entries is midday ZST on Thursday 5th September 2013. You can also follow a number of our contributors (some of whom don't blog) on Twitter.